Reign 522 B.C.E. to 485/486 B.C.E. Died 485 B.C.E. or 486 B.C.E. Darius the Great (Darayawush I) (ca. 549 B.C.E. – 485/486 B.C.E. ; Old Persian Dārayawuš: "He Who Holds Firm the Good"), was the son of Hystaspes and Persian Emperor from 521 B.C.E. to 485/486 B.C.E. His name in Modern Persian is داریوش (Dariush), in Hebrew דַּרְיָוֵשׁ (Daryawesh) and the ancient Greek sources call him Dareios. Darius ruled over some 50 million people and the largest empire that the world had known. He did much to promote trade and commerce. He developed the infrastructure of the empire by constructing canals, underground waterways, and roads. Darius practiced religious tolerance, did not allow slavery and although he invaded Greece, he promoted the idea that the Greeks and Persians were members of kindred peoples. He employed some Greeks in senior positions. He listened to the opinions of non-Persians but mainly depended on Persians to administer the empire, building on the work of Cyrus the Great who divided the territory into provinces (Satrapies). Making Susa his capital, he left behind a rich architectural legacy. Famously, he allowed the Jews to rebuild the Jerusalem Temple. Darius in his inscriptions appears as a fervent believer in the monotheistic religion of Zoroaster. He was also a great statesman and organizer. 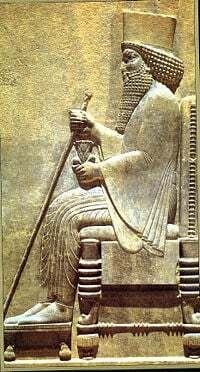 Darius thoroughly revised the Persian system of administration and also the legal code. His revisions of the legal code revolved around laws of evidence, slave sales, deposits, bribery, and assault. The time of conquests had come to an end; the wars which Darius undertook, like those of Augustus, only served the purpose of gaining strong natural frontiers for the empire and keeping down the barbarous tribes on its borders. Thus Darius subjugated the wild nations of the Pontic and Armenian mountains, and extended the Persian dominion to the Caucasus; for the same reasons he fought against the Saka and other Iranian steppe tribes, as well as the mysterious Turanians from beyond the Oxus. In the process of these campaigns he made military reforms such as introducing conscription, pay for soldiers, military training and he also made changes in the army and navy. But by the organization which he gave to the empire he became the true successor of the great Cyrus. His organization of the provinces and the fixing of the tributes is described by Herodotus (iii. 90 if. ), evidently from good official sources. He divided the Persian Empire into twenty provinces, each under the supervision of a governor or satrap. The satrap position was usually hereditary and largely autonomous, allowing each province its own distinct laws, traditions, and elite class. Every region, however, was responsible for paying a gold or silver tribute to the emperor; many areas, such as Babylonia, underwent severe economic decline resulting from these quotas. Each satrapy also had an independent financial controller, an independent military coordinator as well as the satrap, who controlled administration and the law. All three probably reported directly to the king. This more evenly distributed power within the satrapy and lowered the chance of revolt. Darius also increased the bureaucracy of the empire, with many scribes employed to provide records of the administration. A symbolic Imperial sculpture constructed during the reign of Darius I, palace of Persepolis, Iran. Many building projects were initiated during the reign of Darius, with the largest being the building of the new capital of Persepolis. Pasargadae was too well associated with the previous dynasty of Cyrus and Cambyses and so Darius sought a new capital. The city would have walls sixty feet high and thirty-three feet thick and would be an enormous engineering undertaking. Darius' tomb was cut into a rock face not far from the city. He dug a canal from the Nile to Suez, and, as the fragments of a hieroglyphic inscription found there show, his ships sailed from the Nile through the Red Sea by Saba to Persia. Darius also commissioned the extensive road network that was built all over the country. The Persepolis Tablets mention a ‘royal road’ from Susa to Persepolis and from Sardis to Susa built by Darius. It was highly organized with rest stations, guarded garrisons, inns and apparently no bandits. Darius is also remembered for his Behistun Inscription which was chiseled into the rock face near the town of Behistun. It showed Darius' successful ascension to the throne and described Darius' legitimacy to be king. Darius is often renowned above all as being a great financier. He fixed the coinage and introduced the golden Daric. He tried to develop the commerce of the empire, and sent an expedition down the Kabul and the Indus, led by the Carian captain Scylax of Caryanda, who explored the Indian Ocean from the mouth of the Indus to Suez. During his reign, the population increased and industries flourished in towns. Persia under Darius probably had connections with Carthage (cf. the Karka of the Nakshi Rustam inscription) of Sicily and Italy. At the same time he attempted to gain the good-will of the subject nations, and for this purpose promoted the aims of their priests. He allowed the Jews to build the Temple of Jerusalem and issued a decree affirming their legal right to do so (see Ezra 4:24 to 6:15). In Egypt his name appears on the temples which he built in Memphis, Edfu and the Great Oasis. He called the high-priest of Sais, Tzahor, to Susa (as we learn from his inscription in the Vatican Museum), and gave him full powers to reorganize the "house of life," the great medical school of the temple of Sais. In the Egyptian traditions he is considered as one of the great benefactors and lawgivers of the country. In similar relations he stood to the Greek sanctuaries (cf. his rescript to "his slave" Godatas, the inspector of a royal park near Magnesia on the Maeander, in which he grants freedom of taxes and forced labor to the sacred territory of Apollo); all the Greek oracles in Asia Minor and Europe therefore stood on the side of Persia in the Persian Wars and admonished the Greeks against attempting resistance. Weights and measures were standardized (as in a "royal cubit" or a "king’s measure") but often they still operated side by side with their Egyptian or Babylonian counterparts. This would have been a boon for merchants and traders as trade would now have been far simpler. The upgraded communication and administration networks also helped to turn the Empire ruled by the Achaemenid dynasty into a seemingly commercial entity based on generating wealth. Darius also continued the process of religious tolerance to his subjects, which had been important parts of the reigns of Cyrus and Cambyses. Darius himself was likely monotheistic—in royal inscriptions Ahuramazda is the only god mentioned by name. But, time and again he is mentioned worshipping, funding or giving 'lip-service' to various pantheons of gods. This was important as the majority of the empire's inhabitants were polytheists. Also, like many other Persian Kings, he maintained a no-slave policy; for example, all workers at the Persepolis site and other sites made for him were paid, which was revolutionary at the time. His human rights policies were also common to his ancestors and future Persian kings, continuing the legacy of the first human rights document ever made. About 512 B.C.E. 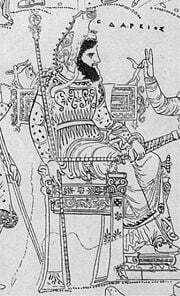 Darius undertook a war against the Scythians. A great army crossed the Bosporus, subjugated eastern Thrace, Macedonia submitted voluntarily, and crossed the Danube. The purpose of this war can only have been to attack the nomadic tribes in the rear and thus to secure peace on the northern frontier of the empire. Yet the whole plan was based upon an incorrect geographical assumption; a common one in that era, and repeated by Alexander the Great and his Macedonians, who believed that on the Hindu Kush (which they called the Caucasus Indicus) and on the shores of the Jaxartes (which they called Tanais, i.e., the River Don) they were quite near to the Black Sea. Of course the expedition undertaken on these grounds could only prove a failure; having advanced for some weeks into the Russian steppes, Darius was forced to return. The details given by Herodotus (according to him, Darius had reached the Volga) are quite fantastic; and the account which Darius himself had given on a tablet, which was added to his great inscription in Behistun, is destroyed with the exception of a few words. Although European Greece was intimately connected with the coasts of Asia Minor, and the opposing parties in the Greek towns were continually soliciting his intervention, Darius did not meddle with their affairs. The Persian wars were begun by the Greeks themselves. The support which Athens and Eretria gave to the rebellious Ionians and Carians made their punishment inevitable as soon as the rebellion had been put down. Darius then sent several expeditions onto mainland Greece. The first expedition, that of Mardonius, failed on the cliffs of Mount Athos (492 B.C.E. ), and the army which was led into Attica by Datis in 490 B.C.E. was beaten at the famous Battle of Marathon. Before Darius had finished his preparations for a third expedition an insurrection broke out in Egypt (486 B.C.E.). In the next year Darius died, probably in October 485 B.C.E., after a reign of thirty-six years. Briant, Pierre. From Cyrus to Alexander: a history of the Persian Empire. Winona Lake, IN: Eisenbraun, 2002. History of "Darius I of Persia"